Protect your equipment from voltage spikes such as lightning, power surges, tripped circuit breakers and more with our multi-outlet surge protector that includes two USB ports and a $400K warranty for connected equipment (see package for details). 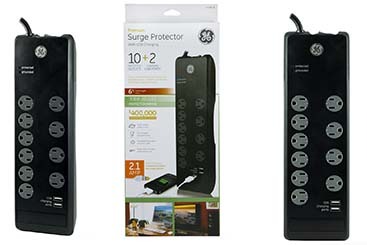 Many consumers confuse a power strip for a surge protector. Power strips give consumers the ability to plug in multiple electronic devices but do not protect the equipment plugged in from voltage spikes or power surges.